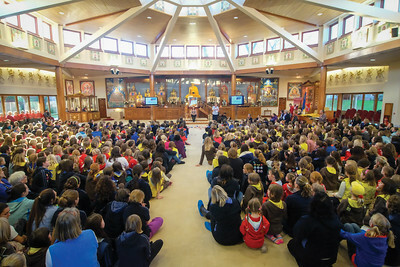 Scouts and Guides groups are very welcome to visit the modern Kadampa Buddhist Temple which is an amazing place that is peaceful and inspiring. They will meet a Buddhist teacher who will share their experience of living a Buddhist way of life. We can explain Buddha’s practical advice on finding peace of mind and happiness, caring for others with compassion and wisdom, and finding solutions to our daily problems. There will be plenty of time for Questions and Answers. Most groups like to come on the evening they normally meet. We can usually take groups on Monday to Thursday evenings with a 1½ hour session between 5.30 and 7pm (the Temple is often in public use from 7.15pm). Sometimes we can manage a later time, please ask. Between 9.30am to 5pm on Monday to Thursday. Maybe you are able to visit during school holidays. Please email your preferred dates to our Visits Manager at visits@manjushri.org, OR ask for an email to be sent with all our currently available dates so you can choose a suitable one. We will also email our Information Pack and separate Booking Form. When the date and arrival time is agreed please email or post your booking form, and we will email a confirmation letter. We are finding it quicker and more efficient to use email. No charge for Leaders or parents.